While the Bobcats season has been complete for over a week, the NCAA tournament is set to kick off next weekend with three ECAC teams participating after Princeton won the league tournament as the number 7 seed. 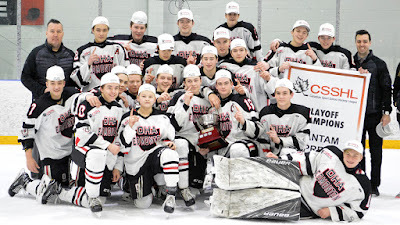 Junior, midget and bantam seasons are starting to wind down with a handful of them already in the playoffs or on the the verge of the playoffs starting. Many Quinnipiac commits were in action over the past week especially in the playoffs so let's see how they did. 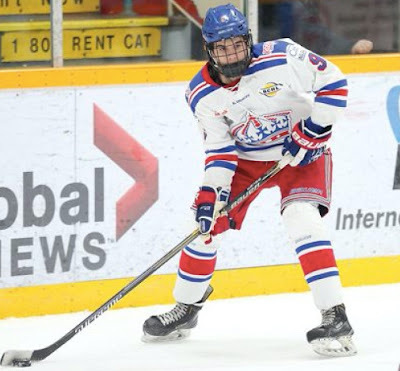 Ethan De Jong had a to point week with 1 goal and 1 assist in two playoff games for the Prince George Spruce Kings. In 9 playoff games he has 8 points (5 goals, 3 assists). His team is currently tied at one game apiece against the Surrey Eagles in the best-of-7 second round series. Desi Burgart had a lone goal in two playoff games this week for the Surrey Eagles as they split the first two games of their best-of-7 series against Prince George. In 8 playoff games, Burgart has 10 points (9 goals, 1 assist). T.J. Friedmann picked up one assist in two games played this week in the postseason for the Victoria Grizzlies. So far in 6 playoff games, Friedmann has 4 points (2 goals, 2 assists). His team is in an 0-2 hole in the second round of the playoffs against Powell River. William Fallstrom had a goal and two assists in two games played for the Fargo Force both wins over the Dubuque Fighting Saints. In 4 games played, he has 37 points (11 goals, 26 assists) with a plus 14 rating. Wyatt Bongiovanni had one assist in two games played for the Muskegon Lumberjacks. He was scratched on Saturday due to an undisclosed injury. On the season in 35 games played he has 33 points (15 goals, 18 assists) with a plus 6 rating. Zach Metsa had one assist in one game played for the Central Illinois Flying Aces. In 52 games played between Central Illinois and Youngstown, Metsa has 21 points (2 goals, 19 assists). He is riding a three game point streak along with points in four of his last five games and six of his last eight. Dom Fensore had one assist in three USHL games over the weekend. In 27 USHL games played, Fensore has 13 points (1 goal, 12 assists). Justin Robbins went 0-2 with 4.21 goals against average and an .887 save percentage for the Chicago Steel. On the season, Robbins is 5-7-0-1 with a 3.73 goals against average and an .881 save percentage in 17 games played. Daniel Winslow had four assists in two playoff games for the Jersey Hitmen as they split the first two games of their best-of-3 first round series against the Northern Cyclones. The decisive Game 3 is today at noon. Matt Cassidy had a lone assist in two playoff wins for the Brooks Bandits who have taken a 2-0 series lead over the Drumheller Dragons. In five playoff games so far he has a goal and an assist. in 3 playoff games so far for the Brooks Bandits as they swept their best-of-five first round series with the Canmore Eagles. They now await their second round opponent. Oscar Plandowski bantam team OHA Edmonton won the CSSBHL championship over the weekend. In 5 games played in the playoffs, Plandowski had 2 points (1 goal, 1 assist). The 2003 Nova Scotian born defenseman will now head to the South Kent School in the fall to play for the U-15 team there. Jack Silich had a goal and three assists in in three regional games for the Chicago Mission as they now head to Nationals on April 5th. Silich has played 73 games this season scoring 95 points (35 goals, 60 assists). Jacob Quillan of the Steele Subaru Major Midgets had a five point week (2 goals, 3 assists) in three wins. His team has taken a 2-0 lead over Halifax McDonalds. In 12 playoff games this year, Quillan has 13 points (5 goals, 8 assists).